The fact that we all have to wear sunscreen is a no-brainer. But beyond that, we have to start making decisions about what type of sunscreen to wear and when. And there’s no one right answer—the best sunscreen for you will depend on a number of factors, including formulation, skin type and level of sun exposure. 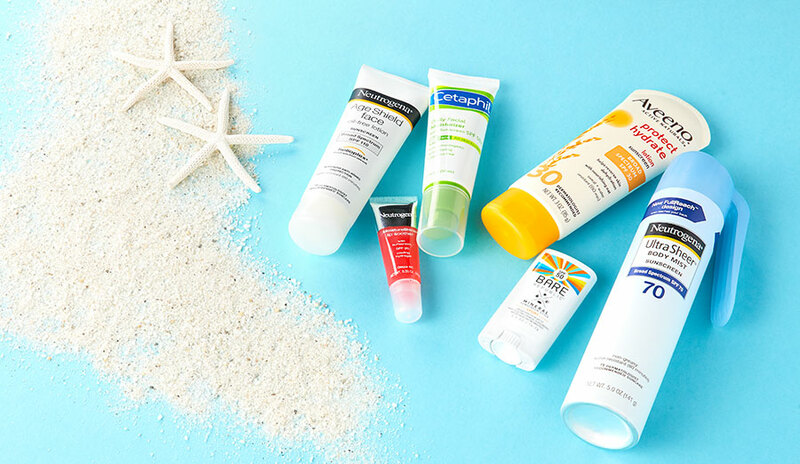 We’ll share our top three tips for choosing the right sunscreen, as well as sun safety principles that apply to everyone. Sunscreen lotions. The most moisturizing formulation; also the most common, so you’ll find a wider range of features among lotions. Sunscreen sprays. Great for applying sunscreen by yourself to hard-to-reach places on the body. Also a good option for people with a lot of body hair or very little hair on their head. Don’t inhale the spray; to apply to your face, spray on your hands then rub on your face. Sunscreen sticks. Less mess than a lotion and highly portable; apply to skin and rub in. Great for travel, especially if you’re worried about a bottle opening or leaking in your luggage. Lip balms with SPF. No matter which formulation you choose for your body and face, remember to protect your lips, too. Unlike the rest of your body, skin on the lips doesn’t contain melanin, which offers some UV protection. Look for lip balm with SPF or wear opaque lipstick. In general, sunscreen has a shelf life of three years once opened; for best results, store it in a cool, dry place. Some packaging includes an expiration date, so check for that as well. The right sunscreen for you will probably change depending on the scenario. So we’ll look at the most common sunscreen scenarios and the types of sunscreen that match up best with them. For starters, think of sunscreen scenarios in two ways: skin type and level of sun exposure. In general, you don’t have to use special sunscreen for your face; you can use the same sunscreen that you use on your body. The exception is if you have problem skin that’s prone to acne or sensitive. Acne-prone skin. Sunscreen can clog pores; choose oil-free formulas for the face and look for “non-comedogenic” on labels, which means it doesn’t contain ingredients known to clog pores. Sensitive skin or if you avoid chemicals. Sensitive skin stays happier when it has the least amount of ingredients to react to. Choose unscented sunscreen with a short ingredient list, sunscreen for sensitive skin or mineral sunscreen without synthetic chemicals. Skin color. Whether you always burn or never burn, you still need to wear sunscreen. Your skin color determines, in part, the SPF level you should wear. If you are fair-skinned and always or usually burn, wear SPF 30 or higher. If you are medium- to dark-skinned, usually tan and rarely or never burn, wear at least SPF 15. Babies and kids. Academic studies have shown that repeated, unprotected sun exposure as a child or even one really bad burn can contribute to skin cancer later in life. Sunscreens for kids have roughly the same formulations as they do for adults but feature scents that children like. Many kids like using spray sunscreen; make sure they don’t inhale the fumes while putting it on: to apply it to the face, spray it on hands then rub on the face. Doctors advise against putting sunscreen on kids younger than six months old; instead, keep them in the shade and dress them in protective clothing and hats. The other factor to keep in mind when choosing sunscreen is your level of sun exposure: how strong the sun is, how long you’ll be exposed to it and what you’ll be doing while in the sun. The strength of the sun is measured on the Ultraviolet (UV) Index, which ranges from 1 (low) to 11+ (extreme); UV is strongest from 10 AM to 4 PM. When the UV Index is at 8 or more, unprotected skin can burn in 15 minutes or less. Curious about the UV Index where you live? The National Weather Service’s Climate Prediction Center tracks the daily UV Index for many locations around the U.S.
Every day. This includes days when you’ll be in a mixture of sun and shade, with minimal time (up to 60 minutes) in the sun. Think: running errands on the weekend. Wear at least SPF 15. Many moisturizers now include SPF in them, usually SPF 15 to 30. This can be a great everyday option but if you are very fair and want to play it safe, apply moisturizer followed by sunscreen. Some foundations and powders also contain SPF; powders are especially helpful for touch-ups throughout the day. Outdoors. This applies if you’ll be mostly outdoors for an extended period of time (two hours or more). Think: picnic or day at the park. Wear SPF 30 or higher, depending on your skin color. Active/sports/swimming. If you’re going to be outdoors and sweating or in water, choose a sunscreen labeled “sweat resistant” or “water resistant.” You might find “sport sunscreens,” but many products also offer these features even though they’re not labeled as “sport.” Check the label so you know whether to reapply every 40 minutes or 80 minutes. Think: hiking, swimming, sightseeing. Wear SPF 30 or higher, depending on your skin color. High elevations or near equator. UV increases with elevation and also as you get closer to the equator. Protect yourself by applying SPF 50 sunscreen to thin-skinned areas like the nose, ears and eye area. Since SPF higher than 30 can make it hard for pores to breathe, wear SPF 30 everywhere else, as well as a hat, long pants and a long-sleeved shirt. Time of year. Wear sunscreen year-round and even when it’s cloudy. How much to apply. Assuming you’re in swimwear, apply about 2 tablespoons of sunscreen to the exposed parts of your body; that’s an average amount, so adjust up or down depending on your size. If applying a spray, go for an even sheen over the whole body. Where to apply. Apply to all exposed parts of your body, including hands and feet, neck, ears and top of head (if skin is exposed). First application. Apply sunscreen 15 minutes before sun exposure and before applying insect repellant if you will be using it. Reapplication. Reapply sunscreen after swimming, excessive sweating or toweling off. Follow label guidelines for reapplication of sweat-resistant or water-resistant sunscreens; at a minimum, reapply every two hours.